Stanford increased its lead atop the Pac-12 standings with a road sweep of USC on Friday night behind an efficient .373 hitting effort. The win, which marked the 17th straight for the Cardinal, moved the team to 19-1, 11-0 Pac-12 and finished off a season sweep of the Trojans, extending Stanford’s win streak in the series to six matches and overall dominance in the all-time series to 65-26-1. Stanford outdid USC in every way, outhitting the Trojans .373 to .172 and besting them in kills (48-36), aces (6-2) and blocks (8-4.5). Audriana Fitzmorris and Kathryn Plummer paced the Cardinal with 14 and 12 kills respectively. Holly Campbell added seven putaways and four blocks, while hitting .636 (7-0-11). Jenna Gray, Tami Alade and Fitzmorris each turned in three blocks. Gray also served up a team-leading three aces. Brooke Botkin downed 10 kills on a .088 hitting effort to lead USC. Jasmine Gross and Khalia Lanier followed with nine kills apiece. Gross hit at a team-bets .692 clip, while Lanier managed just a .037 effort (9-8-27). Madison Murtagh led the team at the net with three blocks. The Cardinal hit .519 in the opening stanza, while holding USC to a .038 effort. 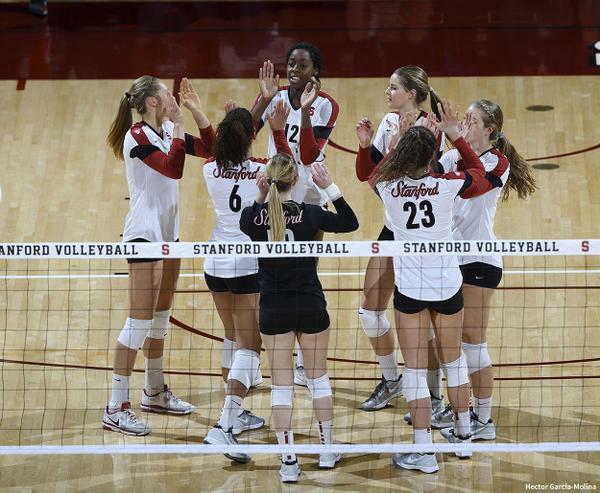 The teams split the first 12 points before Stanford pulled away with a 6-1 run, including two Plummer putaways. The Trojans never recovered as Stanford held at least a four-point edge the rest of the way. Facing set point, USC managed three points in a row, before a service error wrapped up the 25-19 win. The teams were level at 10 in Set 2, before Stanford put together a 54-0 run, including a kill and a block by Plummer and Fitzmorris. USC was within three at 20-17, but the Cardinal finished off the set on a 5-2 run, featuring two Gray aces, and clinched by a pair of Trojan miscues. Stanford led by as many as four in Set 3 at 11-7, but USC came charging back with a 9-2 run, to go up 15-13. Four Cardinal errors and kills by four different players guided the rally. Stanford knotted it up at 16 but soon faced a three point deficit at 22-19. Two Fitzmorris kills and two Trojan hitting errors put the Cardinal back on top at 23-22. USC answered with two points to earn the first of two set-point tries at 24-23. After thwarting another attempt at 25-24, Stanford notched five of the final seven points, winning the match on their third match-point try. After a tie at 27, it was a service error and a Fitzmorris putaway that ended the night. Next up, Stanford plays UCLA on Sunday to wrap up a four-match road trip, while USC plays host to Cal on Sunday.